Weeknight dinners. Enemy of every amateur chef who has to work to put food on the table. This is a pic of our dinner Tuesday night. It was our first full day back at school since we got back from Savannah. Needless to say, we were both pooped! We had to stop at the grocery store on the way home to pick up milk. I was so tempted to grab a frozen pizza and call it good, but I decided to pick up some chicken tenders and baby spinach instead. I brought them home, and a few visits to the pantry later, this is what I came up with. I wanted to get the chicken marinating right away, so I put it in a pyrex dish and zested a lime over it, then squeezed the juice on it. I added salt and pepper, dried ancho chile (ground in the spice grinder), and regular chili powder. Then I toasted some whole cumin seed and whole coriander seed in a dry skillet, and ground them up, too. I used about 2 tablespoons of the ground spice on the chicken. Then I made the chipotle ranch dressing. I use the dry ranch mix in the packet, then add buttermilk instead of regular milk, sour cream and mayo. To make it a little spicy, I added some chipotle powder after it was mixed to the consistency I wanted. The salad part was cucumbers, mushrooms, chopped marinated artichoke hearts, avocado, and chopped picked okra. After I made the salads, I sauteed the chicken in a lightly oiled skillet and put the strips on top of the salads. I crushed blue corn chips and sprinkled on the top like croutons, then added the chipotle ranch dressing. This really was a good salad. 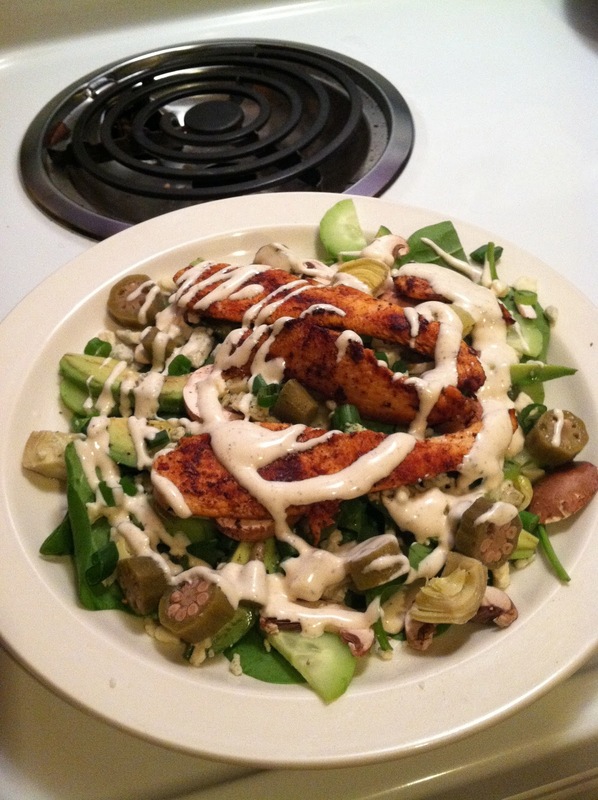 It had the right balance of veggies and protein, and the dressing was really spicy and creamy. I think the secret is marinating the chicken in fresh lime juice, and toasting whole spices to use in the rub. Already ground cumin and coriander you buy at the store is so bland compared to toasting and freshly grinding whole seeds. Yes, it is extra work, but after you taste it, it's hard to go back to using weak, bland spices from the store!